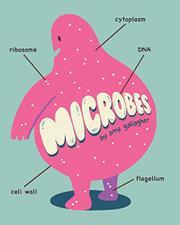 A playful introduction to bacteria, viruses, fungi, algae, archaea, and protozoa. Readers are going to need a basic grounding in cytology from the start, as Gallagher drops such terms as “nucleus” and “organelles” into the discourse without defining them and rushes past plasmids without explaining what they are or do. Likewise, though she fits out all of the jelly-bean–like cells and microbes in her lighthearted illustrations with expressive faces—not to mention occasional limbs, fashion accessories, and hair—she rarely includes recognizable biological components. She’s not particularly systematic either, as she mentions four major components of the human immune system but goes on to describe only two. More usefully, along with frequent mentions of how ubiquitous microbes are, her main focus seems to be laying out microbial types and subtypes, from the five shape-related groups of bacteria to the even more ancient archaea (Crenarchaeota, Euryarchaeota, and Korarchaeota), and describing their individual distinctions and how they reproduce. Polysyllabic as some of this content is, the breezy presentation should impart to general students, as well as budding microbiologists, a nodding acquaintance with our single-celled neighbors and residents.